We specialize in all things real estate and are here to help in all stages of the home process - from renting an apartment, buying/selling your home, developing your dream home to maintaining the roof of your home. Oltmans Development Inc specializes in both Central Arkansas Homes for Sale and Property Developments. Oltmans Development has built numerous homes while perfecting the craft of building quality custom and semi-custom homes in Central Arkansas. When you’re ready to build the home you’ve been dreaming about in the community you want to call home, Oltmans Development will help take you from concept to completion. Oltmans Development can help you find the perfect location for your custom home, build your plan or providing one of our existing plans to get you started, managing the construction process with a focus on quality control, use our industry relationships to negotiate volume pricing on materials, and use knowledge and experience to build energy efficient homes. In addition to building custom and spec homes, we also specialize in room additions, kitchen and bath remodels, roof replacements, and almost any updates or changes you are looking to have done to your home. Oltmans Roofing specializes in composite shingles which are the most popular solution for completing a beautiful home. Durable, cost-effective, and long lasting, composition shingles are fortified with a blend of high-quality roofing materials, able to outlast the most demanding of environments. Today's composition shingles are available with special additives to protect against algae growth and surface damage. Arbor Creek Apartments is an executive style apartment complex that features luxurious two bedroom & two bath apartments. Arbor Creek boasts 1,126 sqft. of living space along with walk-in closets and plenty of room to relax. Some of the amenities include granite countertops, stainless steel appliances, refrigerator with ice maker, full size washer and dryers, ceiling fans in every room, and every apartment has its own private balcony. Rent is $875 per month and tenant is responsible for water/sewer and electricity. Arbor Creek Apartments was built by Oltmans Development and managed by Oltmans Properties LLC. 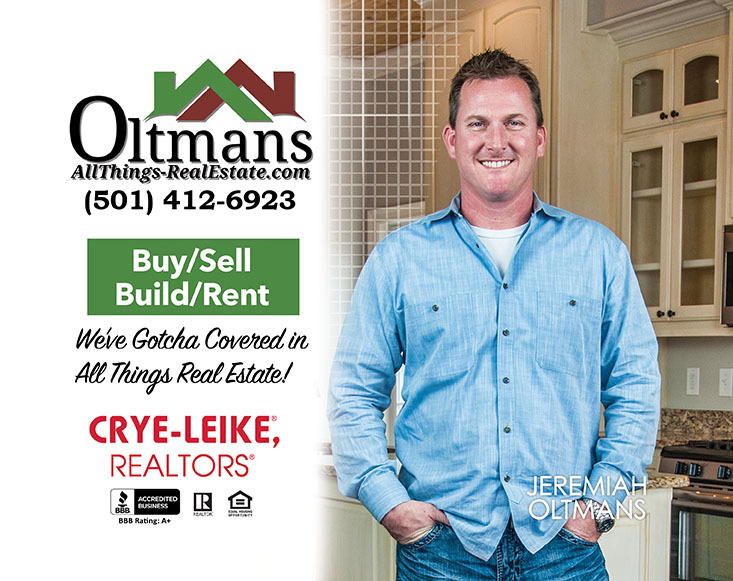 Jeremiah Oltmans is also a licensed Real Estate Agent, earning his Real Estate license in 2006 and joined the team of Crye-Leike Realtors in Bryant. He continues to maintain an active license and work with Crye-Leike as the Managing Broker. Thank you for contacting Oltmans Development. For immediate assistance call us at 501-412-6923.